Had Xavier Cunningham landed fractions of an inch to either side onto the sharp metal spit, he may have been severely injured or killed. 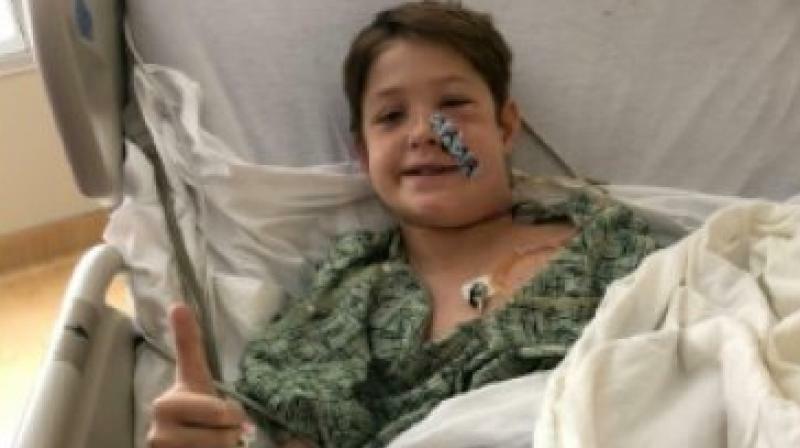 Chicago: A 10-year-old American boy was making a remarkable recovery Wednesday after a meat skewer impaled his skull but missed his brain, in what medics called a "one in a million" accident. Had Xavier Cunningham landed fractions of an inch to either side after falling from a treehouse ladder onto the sharp metal spit fixed upright beneath, he may have been severely injured or killed. Instead, he is getting back on his feet in the Midwestern state of Kansas following surgery Sunday to remove the foot-long skewer embedded from his cheekbone to the back of his neck. "It was one in a million for it to pass five or six inches (13-15 centimeters) through the front of the face to the back and not have hit these things," he added. Ebersole said the skewer plunged through a tiny space in his head surrounded by major blood vessels. "I have not seen anything passed to that depth in a situation that was survivable, let alone one where we think the recovery will be near complete if not complete," Ebersole said. Xavier's ordeal began Saturday afternoon, when he was playing near his home in the neighboring state of Missouri. He was attacked by a swarm of wasps and fell from a tree house, landing face-first on the skewer, which he and his friends had fixed upright into the ground, US media reported. The skewer pierced his left cheek below the eye and went clean through his skull, without piercing the skin in the back of the neck. Xavier roused himself and ran home, still skewered. "I heard screaming," the boy's mother Gabrielle Miller told the Star. "He came in and he had this thing just sticking out." Remarkably, Xavier was able to walk into the emergency room of a local hospital. He was transferred twice to other hospitals, before a qualified surgery team was assembled. There was no serious bleeding, allowing doctors time to carefully prepare for the surgery scheduled for the following morning. But it meant an excruciating wait Saturday night. "He would wake up and come to. He'd be like, 'Am I alive?'" Miller said. Ebersol said Xavier's ability to stay calm and not pull at the skewer overnight gave them the time they needed to make sure they were fully prepared. Around 100 medical personnel took part in the operation, Ebersole said. They slowly removed the skewer, taking care to avoid blood vessels that were within piercing distance. "He proved to be remarkably brave," Ebersole said.